There are over 1000 Adbox panels across Ireland, located outside multiples, symbols and independent newsagents. The uniquely patented Adbox 6 sheet product delivers powerful impact nationally at prime locations, targeting the audience at the point of purchase. The advertising unit operates as a newspaper security unit which forms an integral part of the retail premises. Delivers highly visible, close proximity impacts which achieve a strong on street presence. Point of Purchase panels at multiples and symbol stores. At 90% of Tesco stores. Panels at Forecourts: Texaco, Topaz, Applegreen and Maxol garages in the Republic of Ireland. Adbox Extra allows advertisers to add impact to their Adbox campaign. 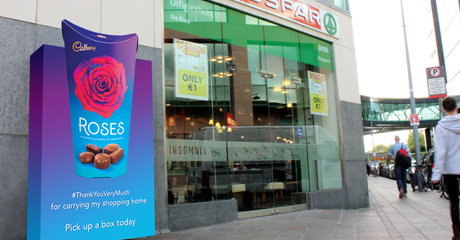 As part of their campaign, 5 high impact special build Adbox covers are installed at prominent Dublin city centre symbol stores - Spar & Centra.